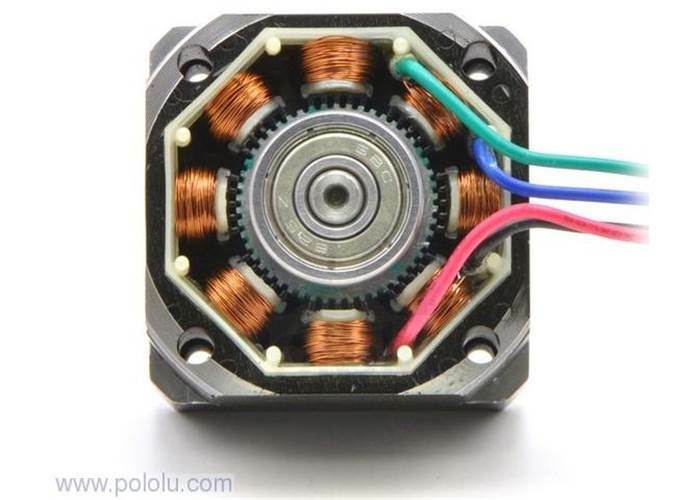 A stepper motor (or step motor) is a brushless, electric motor that can divide a full rotation into a large number of steps. The motor's position can be controlled precisely without any feedback mechanism (see Open-loop controller), as long as the motor is carefully sized to the application. Inductance and resistance slow down the motor. The lower these quantities, the faster it can rotate. If a motor draws 3A at 5V - what current does it draw when driven with 48V? Clearly it must be much lower or it would overheat from dissipated heat. indicates that the drive is a chopper drive- ie, a switching power supply that handles power and probably at 20% energy loss. What is the relationship of number of phases to number of windings? What is the relationship between number of phases and number of wires? Power dissipated by a stepper is I2R - and the actual current out of a power supply is simply P=IV. V_supply >> V_stepper, so current for a high power supply will be lower. Here is information about full vs microstepping - full has 8-10% more torque than microstepping. . If that is true for high speed - then we may want to consider full stepping to get 10% more power. Then the step resolution with our current system goes down to 160 microns from 10 microns (currently we use 16 microstepping). That is still perfectly fine for very large prints. The typical lifetime for a stepper motor is 10,000 operating hours. This approximates to 4.8 years; given the stepper motor operates one eight-hour shift per day. The lifetime of a stepper motor may vary in regards to user application and how rigorous the stepper motor is run. Summary: All motors perform well at speeds < 100 revs/min. Dynamical torque starts to drop off at speeds higher than 300 rev/min. The higher the rated current and the lower the inductance, the better the performance at high speeds. 17PM-K402 - Hybrid 2 and 4 phase - 6 volts rated -  - RAMPS wouldn't run it.